The latest of Cards Against Humanity's holiday things is now available. The 8 Sensible Gifts for Hanukkah promises exactly that for $15. 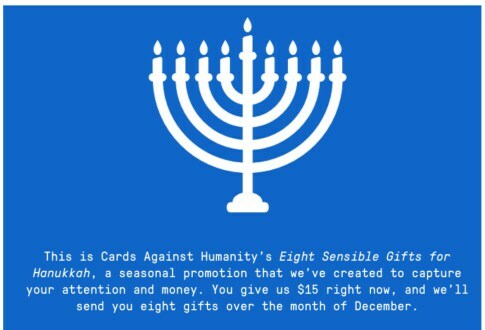 Cards Against Humanity launched its first Holiday pack in 2012 and has run an increasingly complex series every year since. The eight gifts will ship over the month of December and are a complete mystery (as always). Last year's Ten Days of Kwanzaa of Whatever was a massive undertaking that involved a complex puzzle, a small island, a safe and 250,000 images of sloths. Max Temkin has confirmed that this will be the last year this is offered, saying "honestly, it's just so much work." I can't blame them, as disappointing as it will be to not have another one of these maddening things to look forward to. If you're interested in getting in on the fun at all this year, I suggest you order it now. There are only a total of 150,000 slots avaiable and as of writing this tiny little article, there are less that 60,000 left. If you're a fan of the game at all, looking to get into it, or just love in depth puzzles, this is something you won't want to miss.